Where next for Chelsea forward Tammy Abraham? After an encouraging pre-season tour at Chelsea, it’s more than likely that Tammy will benefit more from another loan spell this term – but where? What next for Middlesbrough’s sought-after Adama Traore? Speculation has suggested a few Premier League clubs are interested in making a move to sign Middlesbrough winger Adama Traore this summer, which comes as no surprise given his ability and potential. With that in mind, is leaving the correct decision for the 22-year-old, particularly at such an important stage in his career? Goals from Yaya Touré, Raheem Sterling and a Sergio Agüero brace helped restore some much-needed confidence after a forgettable defeat in midweek at Anfield. Ahead of kick-off, this fixture was billed as a mismatch. In all honesty, it really was. In spite of Manchester City’s troubling inconsistency in the league this term, they’re still in with a shout of winning the Premier League crown come May. Saturday’s vistors, Aston Villa, have the unenvious task of trying to remain in the top flight. Nine points from safety, having only won three league games all season, things look bleak from Remi Garde’s perspective. So they made the trip to the blue half of Manchester, not expecting much. At the half-time interval, they would’ve been quietly surprised that they were still in with a chance of getting an encouraging result out of the game. He was cool, calm, collected. Kelechi Iheanacho, helped seal the Citizens’ passage into Round Five of this year’s FA Cup after a well-taken hat-trick at Villa Park against an out-of-sorts Villa side. Kelechi Iheanacho. Despite finding regular minutes hard to come by in an ever-improving Manchester City side, the talented young Nigerian forward has maintained his aspiration – to keep improving and establish himself in England’s top flight. An admirable attitude, self-belief and undeniable quality were all on-show as the 19-year-old scored a well-taken hat-trick to help seal the Citizens’ passage into this year’s FA Cup Fifth Round. Remi Garde‘s Aston Villa side were out-of-sorts, and struggled to create much in the final third. But in fairness, the visitors had too much quality for them to deal with sufficiently, and ran out deserved winners at Villa Park. Oriol Romeu’s 73rd minute strike ensured Ronald Koeman’s men avoided a fourth consecutive defeat in all competitions – as well as keeping Remi Garde’s wait for a first PL win as Villa manager intact. It was just the one point for Southampton as they entertained Aston Villa in one of Saturday’s 3pm kick-off’s at St.Mary’s, but could – and probably should – have been all three. The hosts, eager to respond positively after a Cup thrashing by Jürgen Klopp’s Liverpool side on Wednesday evening, were boosted by the returns of Jose Fonté as well as James Ward-Prowse and previously suspended Graziano Pellé going into the fixture itself. Maarten Stekelenburg continued in goal, with Jordy Clasie and Shane Long just two of the viable options for Ronald Koeman to choose from the substitutes’ bench. Southampton could have found themselves infront with a two-goal cushion, but somehow, the scoreline remained goalless for the majority of the first-half. Dusan Tadić fired over the crossbar from close-range, after good work down the flank by Sadio Mané to create the opportunity for the Serbian. Then, Tadić created a good chance of his own. His inch-perfect ball curled into the path of Pellé on the run towards goal, but his first-time effort flashed over the woodwork. Victor Wanyama headed wide at the far post, Mané missed a volley, Fonte saw a goalbound effort cleared off the line by opposition striker Rudy Gestede – Southampton were all over their visitors, the opening goal was inevitable. It came in due course, but against the run of play as Villa snatched the lead – on the stroke of halftime no less. Jordan Veretout‘s corner delivery bounced up awkwardly towards the far post, and former Manchester City centre-back Joleon Lescott beat Fonte to the ball, tapping home with ease to break the deadlock in surprising fashion. Going into the interval, So’ton were down and understandably frustrated. They created so many chances, and somehow, they were losing. Virgil van Dijk came close with a headed effort, Wanyama trudged off with a knock whilst substitute Juanmi was lively in the final third, coming ever so close to levelling the scoring. It was only a matter of time, and the goal did eventually come from an unlikely source. Ward-Prowse’ corner-kick delivery floated past the defenders near the goalline, but substitute Oriol Romeu, who’d only been on the pitch for ten minutes, reacted quickly to slot home from close-range and give Southampton a deserved equaliser. The hosts pressed for a late winner, but the tempo of the game itself was overshadowed by plenty of timewasting tactics by the visitors – souring the mood and flow of the game in the dying stages. Shane Long came on, added another attacking outlet but neither him nor any of his teammates could steal a late winner, despite being the better side on the afternoon. Goals from Moussa Dembele, Dele Alli and Harry Kane condemned Aston Villa to a seventh straight league defeat, as they went down 3-1 to Tottenham Hotspur. Rémi Garde watched from the stands as his Aston Villa side suffered a seventh straight loss in the Premier League, slipping to a 3-1 defeat against Tottenham Hotspur on Monday night. Moussa Dembele barged down the left wing before cutting inside to net with just 140 seconds played, before wonderkid Dele Alli doubled the lead on the stroke of half-time. With Spurs cruising, Villa getting back into the game came as a shock, but they did. Jordan Ayew scored thanks to a deflection on 79 minutes, but it wasn’t enough, and Harry Kane sealed the win in added time. Despite Garde having been unveiled as manager hours before kick-off, interim boss Kevin MacDonald was on the touchline and picked the team. Surprising a few by dropping Jordan Amavi in place of Kieran Richardson once more, there was a very experienced look to Villa’s starting XI, with the likes of Carles Gil only making the bench. At the other end, Mauricio Pochettino had the easy decision of staying with the same 11 who dismantled Bournemouth by five goals to one a week prior. It was indeed Tottenham who started brightly, and were consequently rewarded for their fast start. Just two minutes in, Mousa Dembele shrugged off the advances of Ciaran Clark in-and-around the penalty area, before neatly flicking the ball past Guzan at his near post. Villa had started slowly and were punished to devastating effect, their limp attempts to defend were exposed quite clearly, and they looked out-of-sorts in the early exchanges. However, it was not all doom and gloom. Despite an unfortunate facial injury to Ashley Westwood in the dying embers of the first 45, Garde would have taken positives from his new side’s display. Ultimately, they should have created more in-front of goal, and been more fierce with their pressing out of possession, because they’d given their hosts too much space to roam through midfield and virtually pass the ball around them. This meant for uncomfortable viewing and although they had a few half-chances of their own, the Villans surrendered too much of the ball to warrant a good team performance. Gabriel Agbonlahor should have been more patient when, on a counter attack, Grealish looked to slip him through past Toby Alderweireld. Instead, he was too eager to get in-behind the Spurs backline and ended up being penalized for a needless challenge on the Belgian. Dele Alli doubled Tottenham’s lead with a well-struck effort which nestled into the far corner, and it was deserved – both for the player, who was energetic throughout – and his teammates. But even still, the game was far from over. As the second-half began, Spurs continued with the same pressing intensity that they’d finished the first with. Villa initially had rare spells of possession, but a loose ball or lapse in concentration saw a turnover in play, where the hosts were able to attack with both speed and purpose too. Guzan watched on thankfully as Rose’ effort flashed over the crossbar, after a teasing ball towards the back post by Erik Lamela, getting the better of Richardson on the edge of the area. Carles Gil was introduced with twenty-five minutes to play, in place of Jack Grealish – who was uncharacteristically quiet at times, apart from his well-struck effort which swerved narrowly wide of Lloris’ near post in the first 45. Richardson saw his name in the referee’s book for a late, cynical challenge on Lamela, who’d already skipped past him with audacious ease down the flank – and the chances started to dry up with the clock ticking down on the evening’s affair. Christian Eriksen had two free-kick efforts: the first, cannoned back off the wall, the second, swerved wide of the crossbar – but an improved strike from the Dane’s first. Even though they were two-nil up, they were also far from plain sailing. Rudy Gestede, on at the break for an ineffective Agbonlahor, should have taken his opportunity at goal with more composure. Instead he watched on with frustration as his effort sailed over the bar and towards the supporters behind the crowd, as it seemed it was probably not going to be Villa’s night. But, football can change in a blink of an eye. It did so with just ten minutes to go, after Leandro Bacuna‘s stinging effort from range hit the post and ricocheted off the back of Lloris, Spurs failed to clear the ball convincingly enough, with Ayew profiting from a fortunate deflection to halve the deficit in dramatic style. At two-one, the momentum was firmly in Villa’s favour and Tottenham could have easily seen their lead disintegrate. Instead, they were cautious and intelligent enough to slow the tempo of the game down, making the visitors chase the ball as time was ticking away. The icing was sealed on the cake though, as a quick exchange of passes in the final third firmly put Villa to the sword, as they pushed men forward in search of a late equaliser. Eriksen evaded the challenge of Joleon Lescott on the counter before squaring the ball to his right to accomodate Lamela’s run, and Harry Kane’s sweetly-struck effort flew into the top corner to ensure they took all three points in an intriguing fixture. As they patiently wait for the appointment of a new manager, Aston Villa will be hoping for a surprise victory as they go head-to-head with Southampton in the Capital One Cup, with the chance to progress into the last eight of the competition. Southampton entertain Aston Villa in the Last 16 of this year’s Capital One Cup on Wednesday night, with both teams set to make alterations to their respective starting elevens. This match is an important one for both because Southampton will be undoubtedly targeting a trip to Wembley this term – having struggled to cope with the demands of the Europa League, being knocked out in the play-off rounds. On the other hand for Villa, they need to win a game somewhere, somehow – be it late drama, extra time or even penalties. This will help to collectively boost the team’s morale, after a rather forgettable start to the 2015/16 campaign already. Both sides know how to counter-attack at speed, but the Saints‘ defensively offer more stability, something that the visitors may struggle to contend with at times. Aston Villa will be boosted by the returns of defensive duo Ciaran Clark and Jores Okore from injury, whilst caretaker manager Kevin MacDonald may also recall Libor Kozak and Charles N’Zogbia into the matchday squad. Gary Gardner (ankle) is sidelined, but other than that, the Claret and Blues are at relatively full strength and you’d expect them to name a strong team – considering the competition is a welcome distraction from their poor Premier League form. As for Southampton, they’ve only got two first-team players currently injured. Goalkeeper Fraser Forster, and defender Florin Gardos, both of which have sustained long-term injuries in the past, and will not be fully recovered until the new year in 2016. Shane Long and Jay Rodriguez both have ankle knocks, but could feature nonetheless, whilst winger Sadio Mané is suspended – having picked up two bookings in quick succession during their 1-1 draw with Liverpool on Sunday. However, his ban may seem like a blessing in disguise to many of the fringe players hovering around the squad, with the likes of Juanmi, Gaston Ramiréz and Ryan Seager all eager to get minutes under their belt in the search for regular, competitive football, to be able to impress Ronald Koeman. The beauty of the cup includes the fact that form means nothing, and Villa will certainly be motivated for the fixture itself. Whether they can actually prevail though, is a different story – against a Southampton side hoping to prove they’re amongst the big clubs in England’s top flight. Southampton (4-2-3-1): Stekelenberg; Martina, Caulker, Fonte, Targett; Romeu, Clasie; Ramiréz, Juanmi, Ward-Prowse and Pellé. Aston Villa (4-2-3-1): Guzan; Richards, Lescott, Hutton, Bacuna; Sanchez, Gueye; Sinclair, Agbonlahor, Grealish and Gestede. In the day’s only Premier League FA Cup tie, Aston Villa hosted Midlands rivals West Brom just days after their 1-0 victory in the league. Who would prevail, for a place in the semi-finals of the FA Cup? Second-half goals from Fabian Delph and Scott Sinclair sealed a sweet 2-0 victory for Tim Sherwood‘s men, over their local rivals just four days after their 1-0 Premier League win over Tony Pulis‘ men, to confirm they are the first team to secure their place in the FA Cup semi-finals. West Brom had their fair share of chances in the opening 45 minutes, but failed to make them count. Ideye Brown especially, the Nigerian striker who had two excellent goal-scoring opportunities, which he failed to take advantage of. At the half-time interval, the scores were still level, and the game was in need of a spark. Delph delivered that spark, in the 51st minute with a low, powerful drive beyond goalkeeper Boaz Myhill, who arguably should have done better to deny the Englishman from breaking the deadlock – but could not sort his feet out quickly enough to stop the effort. In the final ten minutes plus stoppages to play, the game heated up once more. First, midfielder Claudio Yacob was given his second yellow card and consequently sent off by referee Anthony Taylor for a tackle on Leandro Bacuna, who slid in to try and win the ball. Controversial, as Yacob got to the ball first, and Bacuna’s slide was dangerous play in itself, but the Dutchman left the incident unscathed. Then, four minutes later, Villa hit the visitors on the counter attack – former Manchester City and Swansea forward Scott Sinclair doubled the lead for the hosts with a neat finish beyond Myhill after turning his defender inside out, who was helpless to stop the curling effort from swerving into the bottom corner of the net. The 25-year-old wheeled away to celebrate with the home fans, but little did he know that many of them would embrace him near the advertising boards, foreshadowing the controversy to come. In the third minute of stoppage time, young winger Jack Grealish was given a second yellow card, for simulation by the referee – who felt the youngster dived when attempting to latch onto the ball which Joleon Lescott got to first. Replays showed there was in-fact contact, so another controversial decision given by the official before the full-time whistle. 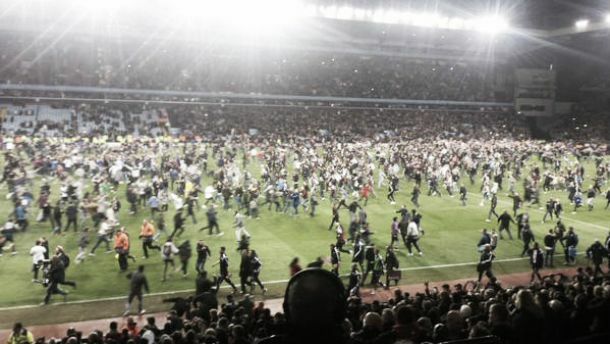 At the full-time whistle, hundreds of Villa fans ran onto the pitch and crowded the players – including captain Delph, who told the media that he was bitten by the home supporters; which is sure to be the main story in tomorrow morning’s newspapers.